I had a major case of “struggleface” when trying to work with the KeychainItemWrapper for iOS. I wanted it to be simple – just take a username and password and put it in the iOS Keychain for secure retrieval later. Turns out that I had to spend an entire work day and do a lot of Googling to get it working so I’m posting this to try and bring all the pieces together. Somehow in my novice experimentation with storing credentials in the keychain I ended up getting a keychainItem on the keychain for a particular test user that couldn’t be updated or removed. I kept getting a cryptic error code (–25299) as I debugged the app when attempting to sign in with that user’s credentials. I spent…well…too long trying to find what the keychain error codes meant. While I started off reviewing the Keychain Services developer documentation page, I didn’t see the section describing the result codes. This is the section that was most helpful in determining what “-25299” meant: errSecDuplicateItem – The item already exists. In my case, the item was in there but the keychain search method didn’t find it, so it tried to add it again, causing a “duplicate keychain item” error message. Things began to work perfectly after the reset. Unfortunately, I spent the majority of the day spinning over the error message trying to find ways to programmatically either remove the keychainItem or reset it so that it would no longer be a duplicate. I’d have been finished hours earlier if I would have just reset the simulator. 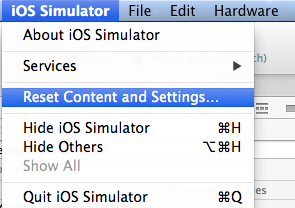 In fact, since I reset the simulator, I’ve been unable to reproduce the scenario I’d gotten myself into. Otherwise I would list the obstacles I was trying to work through for the rest of the day as well. As far as I can tell, it was all stemming from whatever I did at the beginning of the day to get the malformed keychainItem in the keychain. The simulator reset did the trick.